Curious pictorial map of the United States issued by the State Department to promote post-WW2 Japanese tourism. アメリカ合衆國 主要地方資源產物及び風景 / United States Major Regional Resources, Products, and Landscape. This is an unusual c. 1960 Japanese language pictorial map of the United States. The map is intended to illustrate resources, historic sites, and landmarks. There are three inset maps on the lower left detailing the railroad network, airways network, and road network. Although the map is in Japanese, the map was printed in the United States. We are aware of variants of this map in English, French, German, Spanish, Danish, Japanese, Chinese, Vietnamese and Farsi. 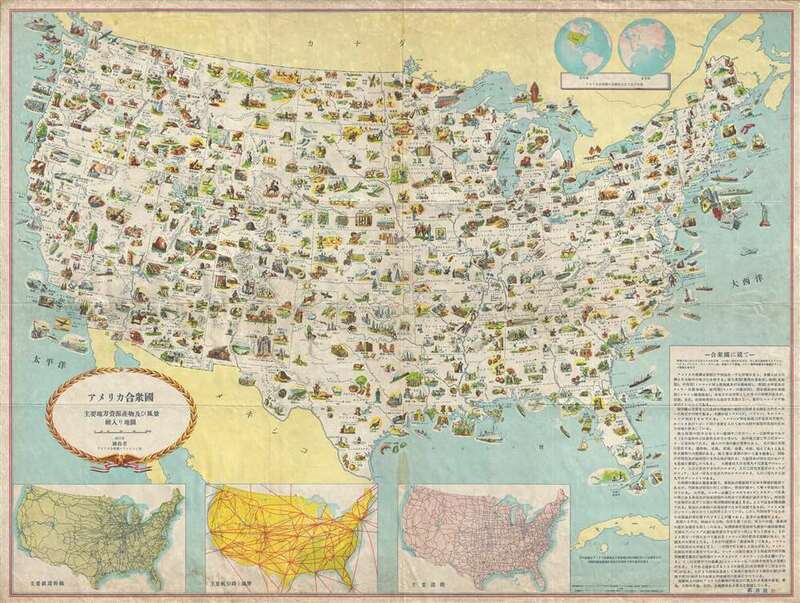 The map was issued by the U.S. Department of State and was most likely intended to promote foreign tourism, as an English language variant of the map, issued by Humble Oil and Refining, is titled Trip Planning Map of the United States. The P. J. Mode collection at Cornell has variant examples in German dating to 1958 and in English dating to 1962. Good. Some wear on original fold lines. Some acid toning. P. J. Mode Collection, Cornell University, 1368.01 (German), 1367.01 (English).